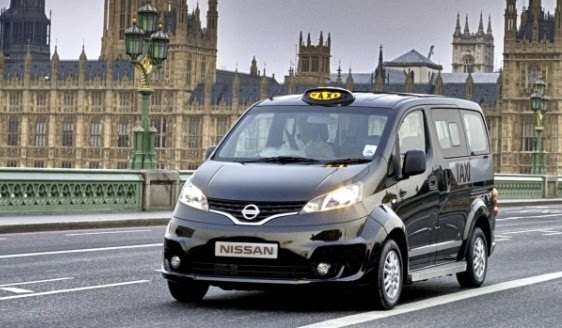 A new taxi for London has recently been unveiled, made by Japanese car manufacturer Nissan, which will go on sale in December. Nissan has reworked one of its existing minivan designs to look like the capital's trademark black cabs. The design is sleek and modern with a new front grille, though the overall shape and size still comforms to the existing black cab design. The Executive Vice President of Nissan, Andy Palmer, said that it was important to retain the classic "bowler-hat" look, so that this new generation of taxis will be instantly recognisable with pedestrians on the busy streets of London. With petrol engines under the hood, these new cabs will be cleaner than the current diesel-fuelled cabs. They will also conform to London's strict public transport regulations. With only two London taxi manufacturers currently in play, this move show that Nissan is challenging the status quo. Nissan is already a popular taxi supplier to Tokyo, Barcelona and New York. We can expect to see these black cabs on the street by the end of 2014.